This Article is set in the background of the consequences of the WTO’s prescriptions on patenting of life-saving medications which has largely contributed to the morphing of patents o n life-saving medication into a luxury. Remarkably, there has been a transformation of the role of patents in the context of pharmaceutical innovation into a strategic business tool leading to a larger interest in creation and sustenance of regulatory rights. The biggest global development in this area is an increased effort to strengthen exclusivity using regulatory protections for all chemicals, and even, biologics, involved in all stages of drug development. Consequently, pharmaceutical companies have expertly navigated this confluence of patents with regulatory data protection to leverage themselves in a manner effectively creating high protection and financial rewards for what materials that could otherwise be susceptible for generic competition. This Article concerns itself with the regulatory regime that effectively provides for exclusivity of clinical trial data. The focus of the Article will be on how and why data exclusivity works for the pharmaceutical industry to promote and/or protect market exclusivity globally. 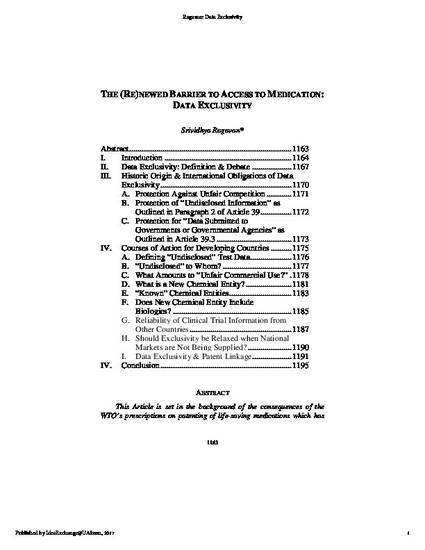 Thus, the Article examines what data exclusivity is, the international trade obligations relating to providing data exclusivity, and the impact of the data exclusivity obligations on access to medication issues, with a specific focus on developing countries while keeping the U.S. regime as the vantage point to examine these issues. The Article outlines how the data exclusivity regime can operate in parallel with the patent regime to add a layer of protection for the data, thus adding to the protection regime for chemical or biologic data. In doing so, this Article will address some of the more controversial issues that have arisen globally with reference to data exclusivity within the larger access to medication debate.